There is no simple answer, but think about your own use of the internet: a video longer than 2 minutes normally has to be pretty damn good for you to give up your valuable time and watch all of it. More likely you’re going to skip bits and get to the end as quickly as you can – rendering pointless all the effort that went into creating it. Exceptions might be high quality content such as ‘Fast Forward’ – the recent video from Kevin Rolland and Julien Regnier, filmed in La Plagne. Although at 6 minutes 13 seconds, there’s still a high chance you won’t have the patience to watch all of this. Research by Wistia found that for a video of 4-5 minutes, less than 60% of viewers will stay to watch all of it, compared with 75% for a 1-2 minute video. And even 120 seconds might be too long. Instagram video, Vine and Snapchat has seen super-short video become more and more popular. Smaller file sizes make it easier to upload and with Facebook auto-starting videos in your Timeline, there’s a higher chance they’ll be viewed in full. You can’t beat a few snowflakes. 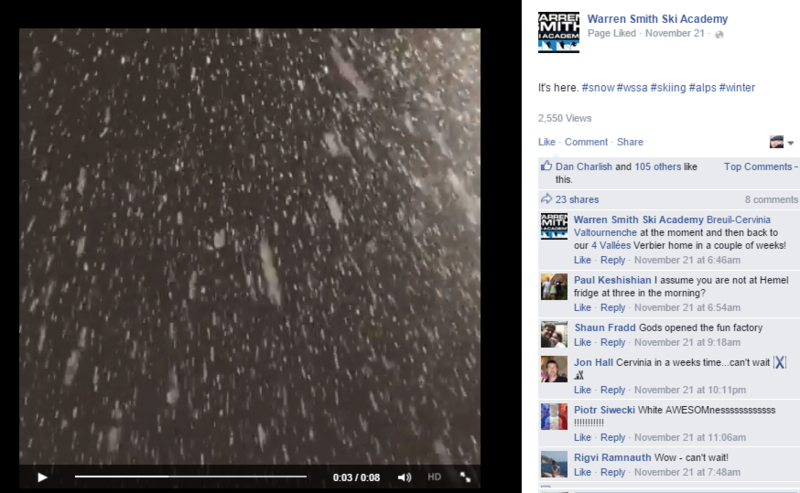 Here’s a tip for anyone in the ski industry – simply film the snow coming down! Look at the great example above from Warren Smith Ski Academy (click on the image to view). This post has been viewed 2500 times, Liked over 100 times and shared 23 times. It’s just 8 seconds long, but it’s hypnotic, beautiful and, importantly, was one of the first posts to go online during the recent snowfall in the Alps. 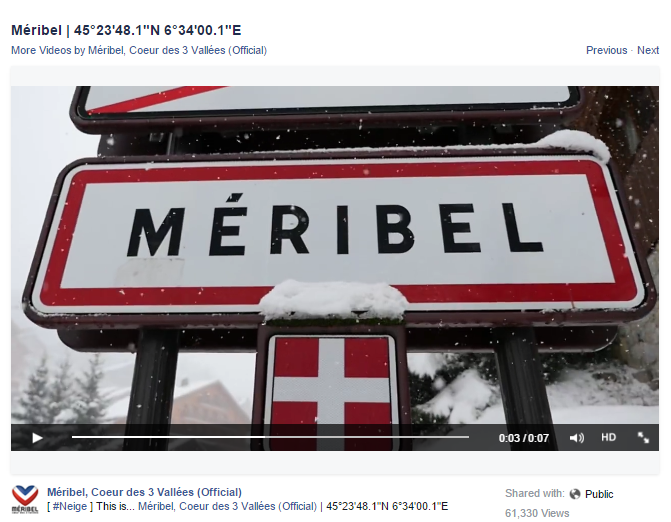 A couple of days later Meribel demonstrated again that video doesn’t need to be complicated. This 7 second video links the resort name with fresh snowfall and gives the viewer a happy warm feeling. So much so that it’s been viewed over 60,000 times with 3000+ Likes and 400+ Shares. So go create – all you need is a phone and few seconds of spare time and you could have a viral hit on your hands!